The description in Baking with Julia for this tart reads “easier to reproduce at home than you’d think at first glance”. I agree. This tart tastes wonderful, looks impressive and was easy to make. What more could you want! It does take a bit of time. You really couldn’t make the entire tart after work one evening. However, you could do it in steps on a couple of evenings. You begin by making the crust then chilling it for at least two hours. Next line the tart pan with the crust and chill for another 30 minutes. Then bake the crust and let it cool while the filling is prepared. The filling is interesting–you peel, core, and slice the apples. Mix them with sugar, flour, cinnamon, soft bread crumbs, and a squeeze or two of lemon juice. (I used a bit of left over Finnish Pulla from the freezer for my soft white bread crumbs). Next the slices are spread on a jelly-roll pan and baked until they are soft enough to mash. 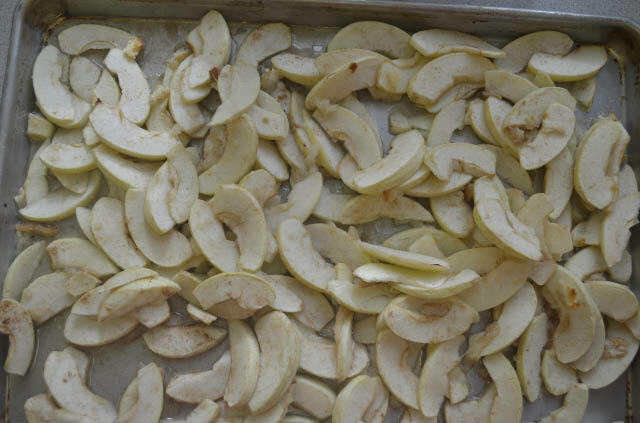 Once they are mashed, spoon the soft filling into the cooled baked shell and arrange the thinly sliced apples on top. It was much easier than I thought it would be to arrange these slices in beautiful overlapping circles. I made this tart as dessert for Christmas lunch with friends. Served with vanilla ice cream — it was a hit! This post participates in the baking challenge Tuesdays with Dorie (TWD). Gaye of Laws of the Kitchen was our host for this assignment and she posted the complete (and very long) recipe, including the pie crust recipe on her blog. 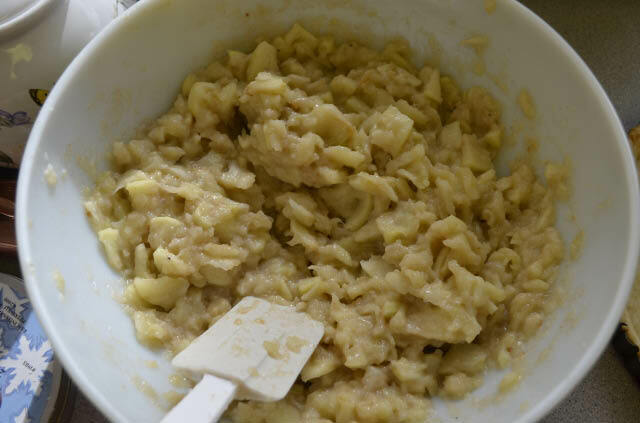 If you would like to read what all of this weeks participants thought about this recipe you can visit TWD’s LYL–Leave Your Link post and find the links to all the participant’s blogs. Oh, I like the idea of using the pulla as bread crumbs! I bed that added another level of flavor to it – just a hint of something exotic. I really felt like the filling needed something more than just a pinch of cinnamon. Your tart looks absolutely delicious! Yes…I think it had just a hint of cardamon. I will definitely make this again, but in stages….too much in one day. I loved the Pulla and since that was the only white bread I had on hand it seemed like a good match. Using the Pulla was a great idea! I bet a little cardamon would be great mixed into the apples. Your tart looks simply beautiful! Nicely done!! Thanks. I did enjoy this one. 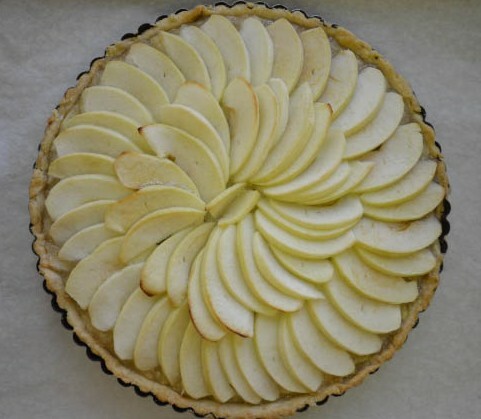 A lovely looking tart! I wish I had some Pulla left over. A hint of cardamom would be a great touch to this dessert. Your design is picture perfect! Thanks. I loved the Pulla so much I actually made it twice! I am sure the pulla added a lovely background. Your tart came out beautifully.